Desc as of 3 Jan 1946: Married. 1 child over 16 years. Victor = 28 yrs 11 mths, 6′ 1.5″, Brown eyes, med complexion, dark brown hair. Missing 1st joint on right hand index finder. Appendix scar. Constable Vic McCrohon, of Clarence Town, is absent on special duty. He is giving revolver instruction to country police stations. The Annual Meeting of the Clarence Town and District 1939 – 45 War Memorial Committee will be held in the School of Arts Hall, Clarence Town, next Monday night, 7th May, at 8 p.m. Business: Important. On Thursday, 16th February, Brigadier D. MacArthur Onslow paid a visit to Clarence Town to carry out an inspection of the area with regard to the formation of a unit of the Citizens Forces in the district. He was very high in his praise of the district and stated that it was ideally suited for the formation of an amphibious unit of the Citizen Forces. However, the lack of a suitable building that could be utilized as a Drill Hall was an obstacle but despite this he felt sure that he could convince the authorities that the expense of erecting one would be justified as it was his considered opinion that it was to the men on the land that this country could depend upon. The men in the closer settled areas have many distractions whilst the man on the land is a deeper thinker and realises the need for Citizen Military Forces. The Brigadier was met by Mr. Vic. McCrohon, who served under him during the last war and was later met by Mr. M. W. Dark and various other citizens of the district. He stated that he thought that Clarence Town had very good prospects of having an industry set up because the Williams River was so well suited to shipping. He would not hesitate in recommending the district to anyone requiring a factory site. It may be remembered that the Brigadier is a man of many business interests, one such business being the Camden Vale Dairies which is in the process of having a circular dairy installed — the third in the world and the first in the southern hemisphere. The annual meeting of the Clarence Town Football Club took place on Saturday, February 18th, when the balance sheet for the year 1949 was presented and the election of officers for 1960 took place. In opening the meeting the chairman, Mr. J. Moylan, congratulated the club on the performance it had put up last year both on the field of sport and on its splendid financial position for the commencement of a new season. He pointed out that when the club was formed last year that except for approximately three players who had had previous experience the remainder had only the spirit of the game to offer; as the season had progressed and more people became interested in the sport the local lads improved their game and by the end of the season had improved beyond all expectations. Many older hands had expressed their amazement at the manner in which the team had improved its game. He then complimented Mr. Vic McCrohon on the splendid financial position of the club, which, after having bought 15 complete sets of gear and two footballs ended the season with a credit balance of £66/11/34. The election of officers tor the coming season then took place and resulted in Mr. J. Moylan being re-elected as President and Mr. V. H. McCrohon being re-elected secretary treasurer. Mr. W. McCrohon is spending the week-end with his brother, Constable Vic McCrohon, and Mrs. McCrohon, after coming out of Army camp at Singleton. On Sunday, a B Grade side from Dungog journeyed to Clarence Town and played a picnic match. After leading 7-niI at half-time, Clarence Town beat Dungog 7 points to 3. Ross Haggarty scored for Dungog. Constable Vic McCrohon is moulding a fine team together in Clarence Town. Flashing his torch through the doorway of a Scott Street shop about 11.30 p.m. on June 25, Probationary Constable Victor McCrohon saw a young man huddled in his overcoat against the counter. Leslie John Cable, 18. soldier, was charged with breaking and entering the lock-up shop of Helen Payzis at 105 Scott Street, Newcastle, on June 25 and stealing £9 8s 11d in money, one fountain pen, six keys, one ring, two tax stamps valued at 5s 9d and a quantity of confectionery to the total value of £12 10s. He was also charged with having, at Newcastle on June 25, broken and entered a lock-up shop at 5 Wolfe Street with intent to steal. He was committed for trial at Newcastle Quarter Sessions on July 22. He signed a statement admitting he gained entry with a piece of flat steel. Cable was questioned about breaking and entering the premises of Blachford in Wolfe Street. He said he used a flat piece of steel to gain entry. It is a well known fact that our Regt in its day contained some extraordinarily talented men within its ranks. In some cases this talent was not immediately apparent but in due course, the qualities of courage, leadership, downright commonsense etc was to come to the fore, so these individuals could be alluded to as “mighty men”. Such was the case with Vic McCrohon. In later years he was known as a “mighty man” both in the Police and the RSL. Late last year some 300 people attended his funeral at Griffith, NSW, many of this number being Police and ex-servicemen, as Vic had a distinguished military and police record. He first enlisted at Maitland on November 4, 1939 with the 6th Div Reconnaissance Regt, and saw service in the first middle east desert campaign. He served with the Long Range desert patrol in the 2nd desert campaign and after serving also in the Syrian campaign, he was promoted to Sgt and mentioned in despatches. He was mentioned in despatches for the 2nd time in 1942 after the Buna campaign. Just prior to this he had been an instructor with the 2/6 Armd Regt. 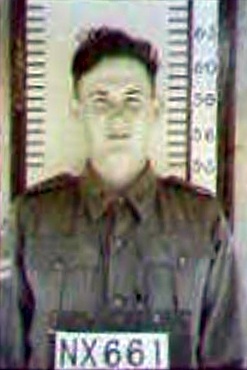 In 1943 he was posted to combined Infantry and tank instruction at Cunnungra. Later he was posted to Western Australia, and then Richmond where he was promoted to Captain before going to Timor on Special Service. At Puckapunyal he was promoted to Major in charge of the Tank gunnery wing, till his discharge from the army on Feb 4th, 1946. On that same day he joined the RSL and the Police Force as a probationary constable. 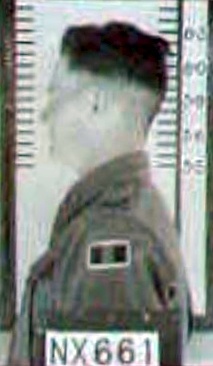 On July 1, 1967 he was promoted to Sergeant. He was transferred to Griffith in 1965 where he spent the rest of his service till retirement in 1967. Throughout his career in the force he took part in many police activities too varied for comment here. Suffice to say he was presented with the Police Long Service and good conduct medal on 28th March, 1972. For ten years he was Sec/Treasurer of the Riverina District RSL and was later awarded Honorary Life Membership – so I think you will agree that his “mighty man” title was very well merited. On Warren front, the second stage of the Australian 18th Brigade’s offensive against Buna was to take place on the inland flank of the 2/9th Battalion, south of Simemi Creek. Lieutenant-Colonel James Dobbs’s 2/10th Battalion, having arrived from Milne Bay, would attack along the old Buna airstrip. Patrols had already moved along Simemi Creek, and on December 23 Captain Austen Ifould’s B Company had captured the bridge, a goal that had eluded the American infantry for over a month. The 2/10th then consolidated at the eastern end of the kunai-covered airstrip while the American engineers repaired the bridge. The Japanese defenders here were some of Captain Yasuda’s crack naval troops. Seaman Masaji Konagaya wrote: ‘Although we only had a handful of men, we defended our positions with desperate efforts’. On the next day, December 24, Brigadier Wootten decided to send four of the Australian Stuart tanks across the bridge to support the attack along the airstrip. Japanese guns were known to be in the area, but they had been silent for some days, and it was hoped that they had been destroyed by air attacks. At 0935, after a short barrage, Lieutenant McCrohon’s and Corporal Barnet’s tanks crossed the bridge and headed up the strip. They advanced some 250 yards in short order, and McCrohon began engaging machine-gun posts. Then, at about 1000, McCrohon saw a flash off to his left front and his tank was hit down low on the body. The wireless was dislodged and the tank slewed into a flooded bomb crater, where it remained bogged. Barnet’s tank was then ……. How a lucky shot put out of action a Heinkel fighter in the Sollum area is described by Sergeant V. McCrohon in a letter to his brother, Mr. A. McCrohon, of Boolaroo School staff. An armored tank detachment, of which Sergeant McCrohon is attached, was awaiting orders to go into action and was being continually harassed by the German machine. A private member of the supporting Infantry column casually remarked that he would fix the blighter and, raising his service rifle, fired. The Heinkel faltered in its course and was obliged to make a forced landing. An inspection of the machine revealed that the bullet had severed a vital link in the rudder control mechanism. The crew of the Heinkel was taken prisoner. Sergeant McCrohon was the driver of the first tank to enter Bengazi. SERGEANT ( A.I.F. ) McCROHON FAREWELLED. At a brief ceremony held at Paxton Picture Hall last Saturday night, Paxton people assembled to bid farewell to Sergeant Victor McCrohon, who is shortly to go overseas with the 2nd A.I.F., making the fourth local representative to assist in England’s democratic fight. Handing over a set of hair brushes and fountain pen and pencil, Mr. P. S. McLeish complimented Sergeant McCrohon upon having been accepted to serve with the 2nd A.I.F, and conveyed the good wishes of Paxton people for a safe journey, a clean, victorious fight, and a quick return home. Speaking in support, Mrs. F. Hindmarsh said that having known Mr. McCrohon all his life, she felt justified in saying he was a worthy son of Paxton and regretted the cause of his departure. However, he had seen fit to answer Australia’s call, and was certain he would do his best for his country. On behalf of the Great War veterans living in the district, Mr. Ivor Davies expressed the belief that as long as the 2nd A.I.F. was composed of men like Sergeant McCrohon, the old Diggers could rest assured that the spirit of Anzac would never die. In reply, the guest of the evening thanked all responsible for the present, and said he had been set a hard task to justify the nice things said about him. However, he would always endeavour to do the right thing, and trusted that the people of Paxton would continue to maintain their good faith in the boys of the 2nd A.I.F. Simply send the information to Cal@AustralianPolice.com.au and I will update the Memorial page.